Most bathrooms are outfitted with a builder grade overhead light fixture equipped with one or two incandescent light bulbs. While this standard issue lighting solution will certainly get the job done, it does nothing to add to the ambiance of the room. The simple home addition of a thoughtful wall or ceiling light fixture such as a pair of wall sconces or an illuminated ceiling fan can go a long way to improve the look and functionality of any bath or powder room. It is also important to look at both the design and construction of the light fixture to see how difficult or easy it may be to clean; an ornate light fixture can be very attractive but it can also be a hassle to maintain and it will not be very attractive if it is always dirty. Due to the high moisture and humidity found in most bathrooms many glass globes and shades tend to fog up and hold both moisture and dust – a hazy light fixture looks bad and puts out far less light. The other factor to think about is how easily the light bulbs can be replaced. It may be simple to insert new light bulbs or it may require a second set of hands which can be a problem. 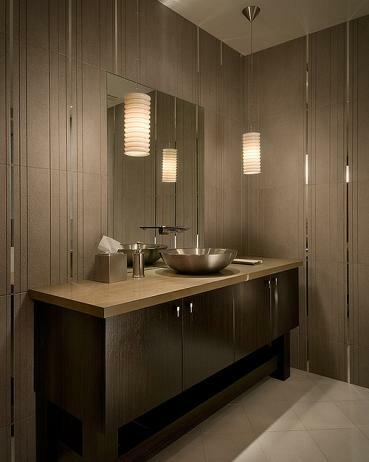 Bathrooms call for various types of lighting; an overhead light fixture can serve as general illumination while vanity lights can serve as task lights. Most bathrooms can benefit from the addition of a night light and a lighted makeup or magnifying mirror. When you are thinking about updating your bathroom lighting it is a good idea to begin by carefully cleaning the existing light fixtures and replacing any burned out or missing bulbs. This will let you really see what you are dealing with and where you might need to add extra light fixtures.